Machu Picchu is one of the most spectacularly beautiful sites on earth, it is an ancient Inca ceremonial center perched on top of a narrow ridge surrounded by snow capped mountain peaks. We were fortunate enough to get Ruben Orellana to meet us there, we had met Ruben the year before and had gone to a ceremony that he arranged with some elders from the highlands. It was an traditional ritual offering to the mountain gods so that when we visited Machu Picchu it would be with the proper consecration. Ruben is a Ph. D. archaeologist, born and raised in Cuzco, and he had been the head archaeologist at Machu Picchu for three years and discovered over forty outlying sites in the surrounding terrain and was an expert in the religious practices of the Inca tradition. What i didn’t know until this trip was that he is a practicing shaman and started as a shaman’s apprentice as a young man. We met him at Ollantytambo and rode the train to Agua Calentes where we took the first bus up the mountain to Machu Picchu. He took us into his old office and showed us beautiful arial photos and read to us from some old Spanish documents. He had found a reference to Machu Picchu in some old Spanish tax records and was documenting the fact that the Spanish did have some awareness of the site in the colonial days. Then he took us up the path around a mountain ledge and suddenly Macchu Picchu came into view. It is a stunning sight of awesome beauty, the main part of the city had a large stone wall protecting it. We came up to the wall and stopped and as we were ready to enter the city I looked up into the clear blue noon day sky and saw a complete rainbow around the sun. I had never seen anything like it, and pointed it out as we all gazed at it in amazement, I put my hand on Ruben’s shoulder, and said “good work Ruben”. Once inside the city walls Ruben took us across the plaza through a complex of buildings into a large room where there are two stone cylinders carved out of the bedrock of the floor. They are about four inches tall and fifteen inches wide with a lip about a quarter inch tall around the top edge, they were full of rain water when we first came upon them. Bingham (the first archaeologist to excavate Machu Picchu) thought they were mortars where the women ground the corn and he took a famous picture of a young boy holding a pestle in one of them but Ruben pointed out that mortars were hollowed out in a concave manner and these have perfectly flat bottoms. He said these were used as reflective mirrors for watching the sky, he said the room never had a roof that it was an observatory where by comparing the images in the two cylinders the ancient astronomers made calculations charting the movement of the stars, planets, sun and moon. Then he instructed us to stand in such a way that we could see the sun reflected in the shallow pool of water. I shifted around until i had the gleaming light of the sun reflected in the center of the pool as I stared at the reflection I noticed there was also a perfect circle of smaller suns reflected over and over around the outer lip in a radiant parhelion of gem like points of light, after a moment of concentration Ruben told us to close our eyes, and as I closed my eyes my vision filled with a deep bright red color field, he then asked us what colors we were seeing and each of us reported a different color. He said that in the Andean traditions there is a color spectrum that runs through the body such that each part of the body is associated with a color and he asked us questions and diagnosed us based on the colors we experienced. It was a marvelous room with an esoteric technology uniting the above and the below, reflecting outward to the distant cosmos and inward to the inner state of the body. 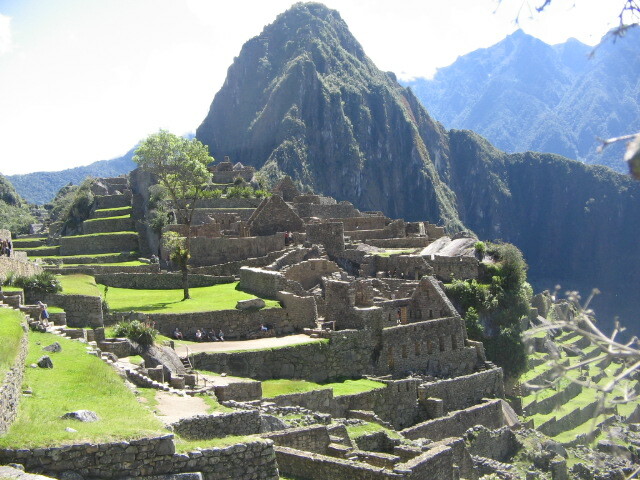 This entry was posted in Uncategorized and tagged Echo stones of Machu PIcchu. Bookmark the permalink.